Arista Networks has announced its first-ever 400GbE switches, one of which is expected to ship by the end of this year, and the second in early 2019. The switches are built on Broadcom’s Tomahawk 3 ASIC, and include new features such as a 50 percent increase in buffer size, elephant flow detection, and two different optics options. Arista targets hyperscale cloud providers, high-performance compute, and service providers and other organizations anticipating data-intensive and bandwidth-hungry applications. The arrival of NVMe will also likely drive demand for greater throughput in storage networks. In addition to the greater throughput, Arista says its 400GbE machines will let customers build higher-density leaf-spine networks while reducing the overall number of switches required. The new switches are the 7060PX4-32 and the 7060DCX-32. As noted, both are built on the Tomahawk 3 chipset, offer a total throughput of 12.8Tbps, and include a 64Mbyte packet buffer, an increase of 50 percent over the Tomahawk 2. Each box is an 1RU device with 32 ports of 400GbE. Ports can also be split out to run 100GbE, giving customers an option to get 128 ports of 100GbE, or to mix and match speeds. 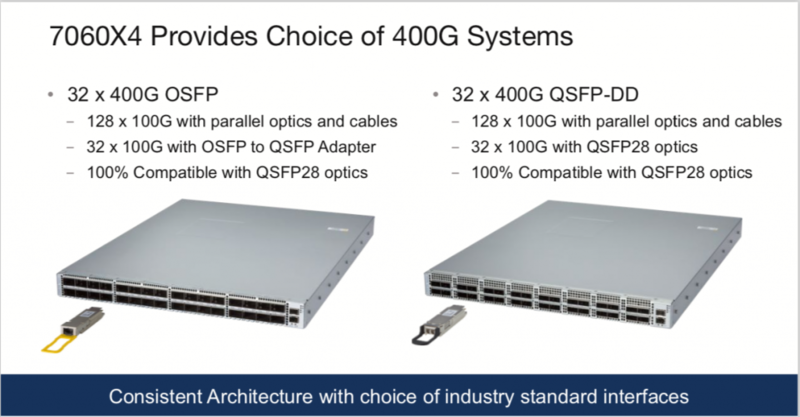 The main difference between the two switches comes down to optics; the 7060PX4 supports OSFP, while the DCX-32 supports QSFP-DD. Arista says the switches will consume less that 5W per 100GbE, but if you’re running at 400GbE, that power consumption will quadruple per port. The PX4-32 model will be available by the end of 2018. The DCX-32 is expected to ship in Q1 of 2019. Pricing is listed at $1,700 per 400GbE port. The Tomahawk 3 enables new traffic management features on the switch, including the detection of elephant flows. In a network with a mix of traffic types, long-lived elephant flows can cause bursty or shorter-lived flows (aka mice) to get stuck in queues. Bursty flows may be latency-sensitive. With the elephant flow detection feature, switches can be configured to detect and reassign larger flows to lower-priority queues, allowing mice to pass through more quickly. Other new traffic management features include dynamic load balancing to tune ECMP-based networks to optimize traffic across all available bandwidth. As mentioned, the new switches also increase the size of the packet buffer, from 42Mbytes in Tomahawk 2 chips to 64Mybtes in the Tomahawk 3. Each port has a minimum guaranteed access to the buffer, but they can also temporarily borrow additional capacity from a shared buffer pool to allow traffic bursts for latency- or loss-sensitive applications. 2021 As The Year Of 400G? Arista and other networking vendors are anticipating significant demand for 400GbE, but that demand will take time to ramp up. Arista anticipates that ramp-up will mirror the transition from 40Gbe to 100GbE, which took about three years for 100G shipments to overtake 40G. Thus, Artista forecasts 2021 as the year when 400G overtakes 100G. Part of the issue is the availability of optics; Arista believes it will take until the first half of 2019 for optics to be available in the large volumes expected by hyperscalers and other big customers. One is “Octal Small Form Factor Pluggable”, the other “Open Shortest Path First” or something like that. Thanks for calling it out. I’ve fixed it.